Your mind body awareness will significantly enhance as you discover more integrated somatic connections during your Pilates sessions. Think of each class as a journey forward to learn something new about yourself. All classes will help to enhance your core strength and elongate muscles resulting in a stronger, taller, leaner, more energized and more flexible you. If you are looking for a smaller waistline, toned glutes, and lean but strong arms and legs then Pilates is for you! Since the classes are small, space is limited to 6 students in Reformer, Tower, Apparatus, and mat classes. We do recommend a minimum of 2 times per week of Pilates practice for best results. Your commitment & dedication to Pilates will deliver results! These classes use spring resistance to help you gain strength and flexibility. The springs provide assistance in some exercises and they add resistance and additional challenge in other exercises. All equipment classes are limited to 6 participants per class so you will maximize your workouts with proper form. All classes are 50 minutes and will give you a whole body workout while incorporating the Principles of Pilates. The Reformer may look intimidating at first with the moving carriage, springs & ropes but you will soon see that the reformer is your new best friend! With endless exercises, the novice to the super advanced will see results on the reformer. With new challenges each class, the workouts are never boring and you will find that the class time flies as you learn new connections in your body. The Jumpboard adds a cardio component to your Pilates workout. The jumpboard is like a trampoline. It’s an invigorating workout that will get your heart pumping! It is recommended that you have several Pilates classes under your belt prior to joining the jumpboard class. If you have knee, back or neck issues we do not suggest the jumpboard. The Pilates Tower adds some fun and exciting new exercises and challenges to your Pilates training. 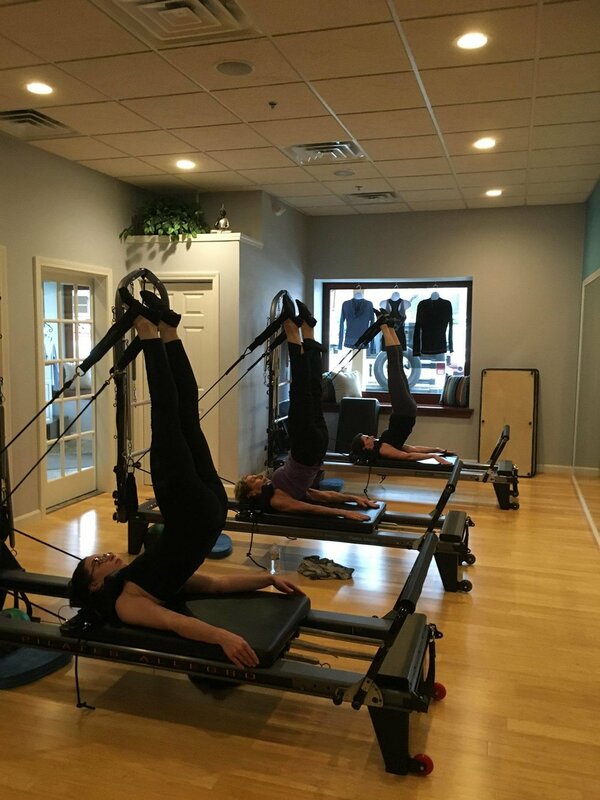 You will work directly with the springs vs the pulley system of the reformer, there are also moving bars and straps so you will get a whole different feeling for movement in your body! Some additional mat exercises will be added to your tower workouts to complete your repertoire of Pilates exercises. The chair may look simple but it is sure to give you some additional challenges with stability, coordination, and balance. The Chair/Mat Class incorporates the mat work as well. Chair is limited to 4 people per class so sign up early! This class is a rotating class that could include any of our Pilates equipment including Reformer, Tower, Chair, Step Barrel, Jumpboard and Mat. If you like a lot of variety then this is a great class to take! Will incorporate some myofacial release and some wonderful recovering, rejuvenating stretches. You work hard all week, this is a recovery class. When you leave you will feel fantastic and as always 2 inches taller! Practicing the series of Pilates mat exercises is an effective and more affordable way to continue to learn Pilates. The classes are limited to 6 participants and the instructor will be actively demonstrating during these classes. We will continue to provide individual cuing as well as the friendly non-intimidating atmosphere that you have come to expect of our studio. This is a multi-level class and modifications as well as advanced challenges will be offered. Additional props may be added to enhance your connections. Monthly members will receive a discount on mat classes. May be incorporated into any of the classes: small balls, foam rollers, the Pilates ring and other props will assist you in finding body awareness and add challenges during your Pilates workout. Pilates Lovers Raving About Our Classes!